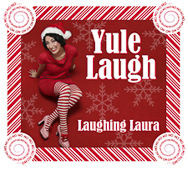 Giggle along with Laughing Laura and the Fabulous Laughers as they laugh the Christmas carols, played by the Luther College Jazz Quartet. It’s an instant party that will have you swingin’ and dancin’ all night. Expect your holiday cheer to reach new heights. Yule laugh, that’s for sure. Fa-la-la-la-la..ha ha ha ha!